Fall in love with Disney all over again with this classic Tinkerbell centrepiece. 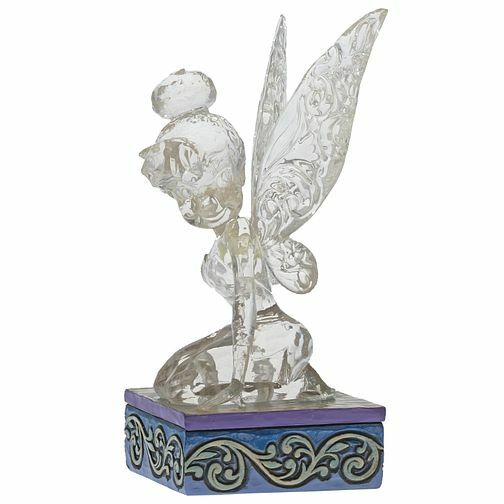 Beautifully sculpted out of clear glass, this delicate figurine sits on solid, resin base with ornate detailing. Made even more special with its signature gift box, this figurine can be displayed on its own or as part of a collection. Note that the colours will vary from product to product. Intended for adults only. Disney Traditions Ice Bright Tinker Bell Glass Figurine is rated 4.0 out of 5 by 1. Rated 4 out of 5 by Anonymous from Disney traditions Loving the new Disney traditions ice not many designs at the moment tinker bell a bit smaller than mickey but cute. The only small problem was with delivery being delivered to store later than expected.